The poet Joseph Langland was raised on the family farm in northeastern Iowa, and earned both a BA (1940) and MA (1941) from the famed writing program at the University of Iowa, before being inducted into the military service during the Second World War. While still in Germany serving with the Allied military government, Langland had printed for his family his first book of poetry, a chapbook titled For Harold (1945), for his younger brother who had been killed in action in the Philippines. Returning home, he taught part-time at Iowa, then joined the faculty at the University of Wyoming (1948-1959), and finally UMass Amherst. Part of a wave of energetic young writers and scholars to arrive on campus, Langland became active in the early years of the Massachusetts Review and became founder the university’s MFA Program for Poets and Writers. A prolific writer, he contributed regularly to literary magazines and was author of The Green Town (1956), The Wheel of Summer (1963), The Sacrifice Poems (1975), Any Body’s Song (1980), and Selected Poems (1991). Langland was recipient of the National Council of the Arts Award, the Melville Cane Award, the Amy Lowell Traveling Poetry Fellowship, and a Ford Faculty Fellowship, among other honors. After his retirement from UMass in 1979, he served as emeritus until his death in 2007. The Langland Papers include a substantial number of original manuscripts of poetry, many unpublished, correspondence with major poets, and an extensive run of Langland’s letters written home to his wife and family during the war. Other Langland Papers are housed at Luther College in Iowa. Joseph Thomas Langland was born in Spring Grove, Minn., on February 16, 1917, one of nine children of Charles M. Langland and Clara Elizabeth Hille, and grew up on his family’s farm in northeastern Iowa. His grandparents were all Norwegian immigrants. After earning an associate’s degree from Santa Ana College in California in 1936, he continued his education at the University of Iowa, graduating with a bachelor’s degree in 1940 and a master’s degree in 1941. Already a published poet, he went to work as an English instructor at Dana College in Nebraska. In early 1942, with the U.S. involvement in World War II still new, Langland’s draft number came up, but he was permitted to finish the school year. He sought admission to the Navy, Marines, and Coast Guard, but his near-sightedness disqualified him from those branches of the military — a sore point, as he felt he was prepared to do anything. Determined to enlist, or to somehow serve the war effort in a significant capacity, he was finally inducted as a private in the US army in August 1942. On June 26, 1943, he married Judith Gail Wood, and she joined him in Texas where he had been stationed at Camp Wolters. A 1937 graduate of Massachusetts Agricultural College from Weymouth Heights, Mass., Wood was studying English at Bread Loaf in Middlebury, Vt., where Langland met her in the summer of 1940. Within months of their marriage, she was living in his hometown of Spring Grove, and he was in Fort Custer, Michigan, preparing to be sent overseas. She would soon return to Massachusetts to train as a nurse. By spring, after much delay, Langland was in England. He would serve in the European Theater, earning an EAME Theater Medal with four bronze stars, American Theater Medal, and a Victory Medal. He was among the troops that opened the concentration camps in the spring of 1945. He rose to the rank of captain and stayed on after VE Day to serve as part of the Allied military government in Bavaria. His younger brother Harold also served; he was killed in action in the Philippines on May. Langland had a chapbook of poetry, For Harold, printed for his family for Christmas in 1945 (it was reissued in 2003 for Harold’s 60th high school reunion). Langland returned from his army service in March 1946, and his eldest child, Joseph, Jr., was born that year two days after Christmas, followed by Elizabeth in 1948 and Paul in 1951. 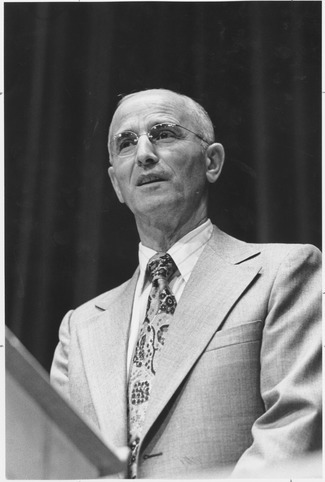 After the war, Langland returned to teaching, first on a part-time basis at the University of Iowa (1946-1948), then at the University of Wyoming (1948-1959), although the 1950s saw him traveling and writing extensively. He had a Ford Faculty Fellowship in the Humanities at Harvard and Columbia (1953-1954) and an Amy Lowell Traveling Poetry Fellowship (1955-1956), which took him to Italy, and he had published his first book of poems, The Green Town (1956), a finalist for the National Book Award, before arriving at the English department of the University of Massachusetts Amherst in 1959. That year, the Massachusetts Review was founded, and Langland was active in its early years as both a poetry editor and a contributor. In the early 1960s, Langland was recorded by the Library of Congress and by Folkways Records reading his own work, and appeared on ABCâ€™s television program “Meet the Professor” on January 6, 1963. His book The Wheel of Summer won the Melville Cane Award, given by the Poetry Society of America, and he received a National Council of the Arts grant in 1966 and took a year’s sabbatical from UMass. He founded UMass’s MFA Program for Poets and Writers in 1964 and for six years served as its director. His wife, Judith, was the first woman (and second person) to earn an MFA from UMass. She had begun studying art in earnest while the family was in Wyoming and continued when they moved to Amherst, receiving her degree in 1966. She continued to study painting, printmaking, and ceramics, and to achieve renown as a painter. Energetic and a passionate advocate for poetry, Joseph Langland organized visits to campus by many noteworthy poets, including the weeklong March Moratorium Poetry Festival in 1970 which featured poets including Donald Hall, David Ignatow, James Tate, Kenneth Koch, Robert Bly, Phyllis Janowitz, and Senator Eugene McCarthy. In 1974, Langland received an honorary degree from Luther College in Iowa. He was acting director of the MFA program for the 1978-1979 academic year, until he retired in 1979 and assumed emeritus status. He continued to be active writing and giving lectures and readings at colleges and universities around the world. Prolific and widely acclaimed, Langland contributed to magazines including The New Yorker, The Nation, the Atlantic, The Paris Review, The Hudson Review, and Poetry, and many other popular and literary publications. His poems have been collected in numerous books as well as anthologized, and some of his work was set to music by composers including Philip Bezanson, Elliot Schwartz, and others. In 1985, Langland was named a Living Art Treasure in Literature for the New England Arts Biennial. Judith Langland died on May 20, 1997. Joseph Langland died on April 9, 2007, at the age of 90. The Langland Papers span Langland’s adult life, with significant material related to his family life, his military service during World War II, and his work as a poet. They include a rich collection of correspondence between Langland and his wife, as well as among a number of Langland’s family members; much of the correspondence covers wartime, including Langland’s own experiences in Europe. There are also original manuscripts of poetry, many of them unpublished; published versions of his work; correspondence with fellow poets; an assortment of family and World War II photographs; and an array of memorabilia. The greater part of the correspondence in this series runs from just before the start of World War II through its end and the immediate postwar era, including Langland’s time in occupied Germany. Most of the letters are between Langland and his wife, Judith, beginning not long after they met. There is also a batch of letters Langland wrote toward the end of the war, sending copies to family members and friends. Alongside these letters is correspondence among various members of the Langland family, particularly during the aftermath of the death of Joseph’s brother Harold, who was killed in action in the Philippines in 1945. In addition, there are letters from fellow poets, diary entries from Langland’s time working on the Valley View family farm in Iowa, and several speeches. This relatively small series includes Langland family photographs and photographs from World War II Europe. Some of the latter depict the Liberation of Paris Victory parades, Utah Beach before landing, and the Buchenwald Concentration Camp. There is also a group of photos taken at the 1995 International Poetry Festival in Struga, Macedonia. A few photographs are filed in Series 1 with letters in which they were enclosed. Drafts of various poems by Joseph Langland, including many first drafts and revisions, along with manuscript copies of some of his books, such as Any Body’s Song and The Green Town, comprise the bulk of this series. Included are various unpublished pieces: prose, lyrics, and short stories. Many items in this series are not dated; most are typed rather than handwritten. This series contains published versions of and printed items related to Langland’s work, in the form of single issues of journals, clippings from magazines, and chapbooks, including For Harold. This series also includes musical scores of Langland’s poems that have been set to music. Newspaper clippings relating to Langland’s public appearances, family, work, career, and involvement in WWII are also part of this series. poetry, a birth announcement for his eldest child, and a portrait painted by UMass Amherst art professor John Dowd. “Poetry! What in the World Are You Saying? Birth Announcement of Joseph T. Langland Jr.
Acquired from David Langland and Elizabeth Langland, 2016. Processed by Ethan Bakuli, 2017. Additional material about Joseph Langland in Special Collections and University Archives is found in the Faculty and Staff Records (RG 40/11). Cite as: Joseph Langland Papers (FS 181). Special Collections and University Archives, University of Massachusetts Amherst Libraries.